TU/e wants to be at the heart of society so has connections with a lot of companies and institutes. 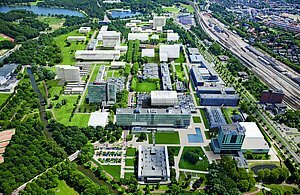 You can see this literally on our campus where more than 100 companies are situated, new companies are established and where major research institutes are settled. Besides the university, the schools of Fontys and Summa are educating the new generation of technological talents. Interested in company accomodation on TU/e Campus? Check out the accommodation possibilities.